Oops it has been a while since I last posted but I have actually been working on the game! As I mentioned in at the end of my last post, the plan was to get the game working end to end. First off I created a number of new classes most extending FContainer. LetterButton for each of the letter buttons that the player can tap, Letter for each of the letters of the word, Keyboard to hold and manage the letter buttons and Word to manage the word. Creating these classes allows me to use the tweening library to animate buttons, words and letters appearing and disappearing. I also added handlers to these classes so that they can callback into the main game code when things happen such as a player tapping a button. In the GameScreen’s Update() method I added some code to increment a time value every second of play. This method also holds a game over check which bounces the user to the game over screen if they exceed 120 seconds of time. For the moment I have also added a simple bar sprite that I resize to represent the time that has passed. I turn this into a more self contained class the future. // has the player run out of time? 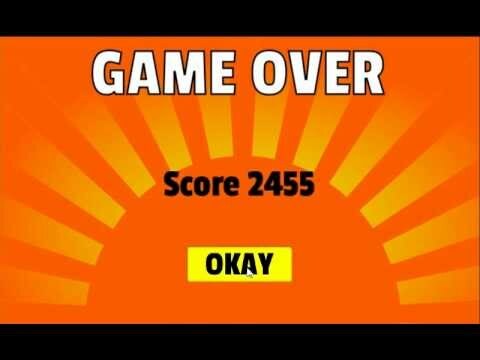 You will also notice the score increment that adds 5 points for every second that the player has survived. // was the letter in the word? // is the word complete? Go.to(word, 0.2f, new TweenConfig (). Proud of my work I handed the game over to Mrs Gremlin… she hated it! After a Q&A session it turns out that a) she doesn’t really like word games but more importantly b) the word list was awful. Even though I had sanitized the list, she felt that the words were just too obscure. For instance “fashioned” was “not a real word”. So I went back to the drawing board and found a list of the 1000 most common words from texts in the Gutenberg Project. I quickly wrote some code to score each word (using the same algorithm I detailed here), sorted the list and dropped the list into the game. This time Mrs G got into the game (particularly when she found out my top score was 7000ish which gave her a target to beat). The progress bar was too easy to miss. I suspect this is because the progress bar doesn’t yet have the DEFCON milestones on it which should hopefully make things way more obvious. Background animations: bombs falling, lasers shooting them down. Planes flying passed etc. So quite a bit to work on. Having said that no one thought the game was terrible and most played several games so I’m hopeful that I have something interesting here.